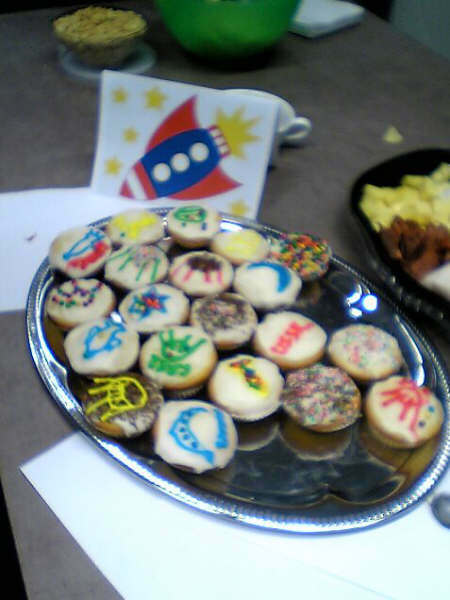 Ever since my esteemed colleague Dr Lynley Wallis made a special batch of cup cakes decorated with spacecraft to help me celebrate the 50th anniversary of Sputnik 1’s launch in 2007, I’ve had a bit of a thing for rocket cakes. They are a staple of children’s birthday parties and represent youthful dreams of being an astronaut – the feeling that anything is possible, our potential is infinite, and we can reach for the stars. • Food decorated or shaped like spacecraft or celestial bodies. In this post, I want to consider the first category, in the form of food that evokes the Sputnik 1 and 2 satellites. These recipes and dishes can be regarded as a sort of performance, half way between tangible and intangible heritage, as they exist only in the moment of their manufacture and disappear in the act of consumption. The USSR’s successful launch of Sputnik 1 in 1957 caught the USA by surprise; and the reactions of panic have been well documented. Suddenly, the night sky was transformed from a serene celestial dome to a place of menace, from which unseen attacks could be launched on the capitalist world. At the same time, there was tremendous excitement that the shackles of gravity had been broken at last and human dreams of space were about to be realised. 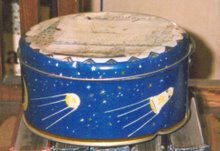 While the US military and government were grappling with the political implications of Sputnik 1, one of the ways in which ordinary people responded was to translate the body of the spacecraft into something familiar and edible. 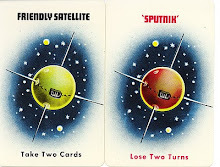 The humble olive, with the addition of three or four toothpicks to represent antenna, became a symbol of the satellite. This was an excellent garnish for a martini, sandwich or the quintessential American food, the hamburger. 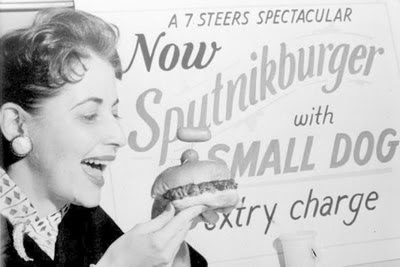 Not to be outdone – Harriet Phydros samples a Sputnikburger which an Atlanta café rushed onto the menu. It’s garnished with Russian dressing and caviar, topped by satellite olive and cocktail hotdog. The hot dog is a reference to Laika the dog, who went into orbit in Sputnik 2 later in 1957. Despite Laika’s sad demise, the visual word play is appealing; but the “not to be outdone” requires further unpacking. Does this imply that Harriet’s imminent consumption of the Sputnikburger will somehow restore the balance of power? Or that eating it is a small conquest of space in its own right? In any case, this potential weapon of mass destruction has become a commodity rather than a beacon of communist ideology. 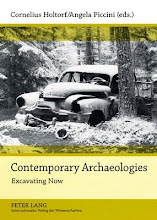 According to Lisa Parks, ‘mainstream American culture commodified and domesticated Sputnik, positioning it within the discourse of American nationalism rather then leaving it to circle the earth on its own accord” (Parks 1995:16). The toothpick antenna appeared in other Sputnik foods. A photograph on the cover of a 1957 Life magazine showed a young woman about to tuck into a Sputnik sundae, surmounted by a ball of icecream studded with toothpicks. A popular hors d’oeuvre of the 1960s featured cubes of cheese, fruit and sausage threaded on toothpicks, then stuck into oranges or melons. Another version of the hamburger combined both concepts. 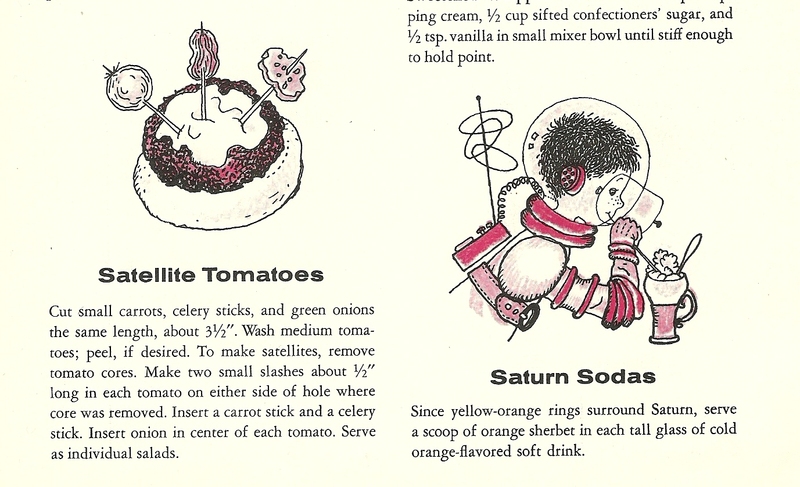 The top image below, from a book on children’s parties, shows a Sputnik cheeseburger (and other delicious space-themed party food). Shake all together and serve in a cocktail glass. William E. Burrows, in his classic “This New Ocean: The Story of the First Space Age”, described the USA’s reaction to the launch of Sputnik 1 as “the Sputnik cocktail: vodka and sour grapes” (Burrows 1998:187). The culinary metaphor continued: at the time, some US politicians, including Eisenhower, blamed the Soviet lead on the hedonist consumer lifestyles of Americans. 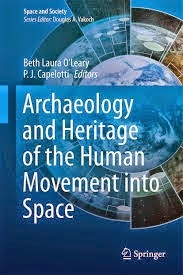 As Burrows frames it, they effectively called upon US citizens “to push away their banana splits, hot fudge sundaes, malteds, cherry-lime rickeys, barbequed steaks, and hot dogs” (Burrows 1998:191), and make sacrifices in order to regain the upper hand in the space race. Capitalist ideology had been dealt a significant blow. Sputnik just turned the East upside-down. As it did everywhere, I suppose it appealed to the imagination. In the Philippines, the restaurants, movie houses and taxicabs were renamed Sputnik. One restaurant even came up with a Sputnik sandwich, the feature of which was an olive with four protruding toothpick ‘antennae’. More important was the diplomatic loss of face suffered. In Hong Kong, Japan and the Philippines, there was a loss of confidence in the United States and, under the surface, a sort of secret glee that [it] had been toppled from the high horse (quoted in Dickson 2001:132). So here, the consumption of Sputnik was almost an act of resistance against US imperialist ambitions in that part of the world. We can see in these few examples that there was an ideological dimension to Cold War food, a literal internalisation of the values that Sputnik was felt to represent for its different audiences (not forgetting that Sputnik was also a sound ……). The culinary legacy of the Cold War in space, however, lives on in the 21st century. Any dish which features long spikey things can be called a sputnik; I’ve seen potato sputniks, a scoop of mashed potato with carrot and cucumber sticks for antenna; and the famous exponent of French cooking, Anne Willan, created a baked Pineapple Sputnik with whole vanilla beans for antenna (Willan 2000). The kohlrabi (a type of turnip) is frequently called the sputnik vegetable, particularly as its leaves are angled just like the satellite’s antennas. I’m not a fan of anything turnippy; and I regret that I don’t like olives, as it’s hard not to appreciate the simple elegance of the olive sputnik. But I think my summer will now feature many Sputnik cocktails ……..
Food for Thinkers is a week-long, distributed, online conversation looking at food-writing from as wide and unusual a variety of perspectives as possible. Between January 18 and January 23, 2011, more than thirty food and non-food writers will respond to a question posed by GOOD's newly-launched Food hub: What does—or could, or even should—it mean to write about food today? 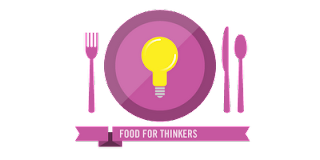 You can check out the conversation in full at GOOD.is/food, join in the comments, and follow the Twitter hashtag #foodforthinkers to keep up-to-date as archaeologists, human rights activists, design critics, and even food writers share their perspective on what makes food so interesting. Thank you very to the information you have posted in this site it give an ideal on what to prepare in the birthday of my son this comming March. I would love you to send me some photos of any space-themed food you prepare for your son's party! Good luck! Well, I made a Sputnik cocktail last night, and it was VERY sour .... VERY. Half the point I suppose but not very enjoyable! I added another half teaspoon of sugar, and had to make it dissolve. @arclight suggests using a simple syrup instead, half sugar and half water. The beauty of the simple syrup is that it is quickly made and keeps for ages. @boringhstrygirl suggests a garnish of a maraschino cherry with 4 toothpicks, immersed, to add a little more sweetness. So a new attempt will be made soon. This is lovey, thank you. I have a space-ship cookie cutter, I bought at the London Science Museum gift shops. Something else that amuses me about the continued power of space-themed food is the way science museum gift shops the world over sell astronauts (freeze dried) ice cream. The science museum in Tokyo sells astro-kimchi. As an aside, could I possible ask you to think about your layout? I'd love to come back to this blog, but the white text on black background is very hard to read (I think many people have a problem with this, but I know it's an especially big problem for a lot of dyslexics, like me). Hi Alice, I have the very same cutter, but have not tried it yet - it looks good in gingerbread! What is it about the astronaut icecream that is so appealing? Perhaps there is something here about domesticating space, making the unfamiliar familiar through food. Definitely a theme I want to explore more. Have not heard of astro-kimchi before! 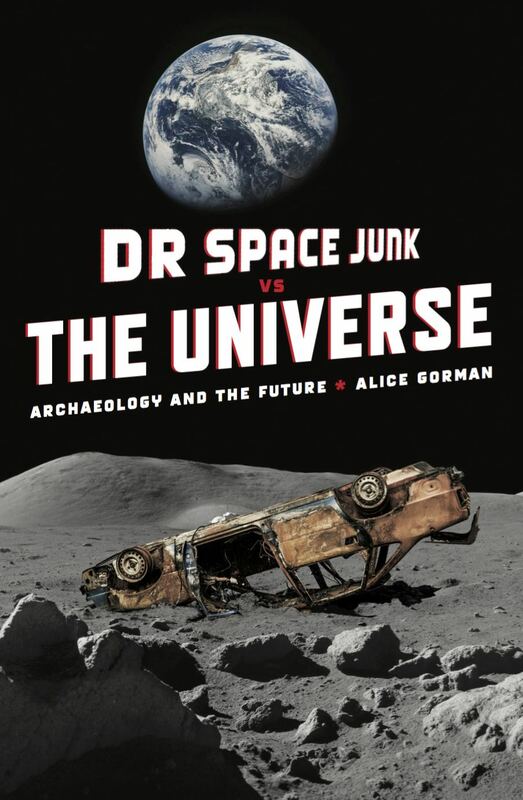 Last week Korean astronaut Dr Soyuen Yi was here in Adelaide; would have been interesting to ask her about this! I have actually spent a bit of time thinking about my layout, as I have not been entirely happy with this template for a while. It was fine in 2004 when I started the blog but does not suit me now. Needless to say, changing it involves a whole bunch of considerations which I won't bore you with. It's good to know about the white text thing in regard to dyslexia though. Perhaps this will spur me on to making some of these complex decisions. Oh, the astronaut cupcakes here http://verysmallanna.com/2009/10/iron-cupcake-music-i/are TOO wonderful, a whole new era in rocket cakes! Thank you, Alice, for passing this on. This article is exactly what I was looking for! I love finding out new things about food from this era. Very informative! My family has a recipe called sputniks. If you're interested, I can send it to you. Hi Gothmum, I would love to see your family recipe for Sputniks! Please do send it to me!